Depending on the climate, geography, and landscape of your backyard and your region of the country, you could be visited by dozens of different backyard bird species during the winter months. 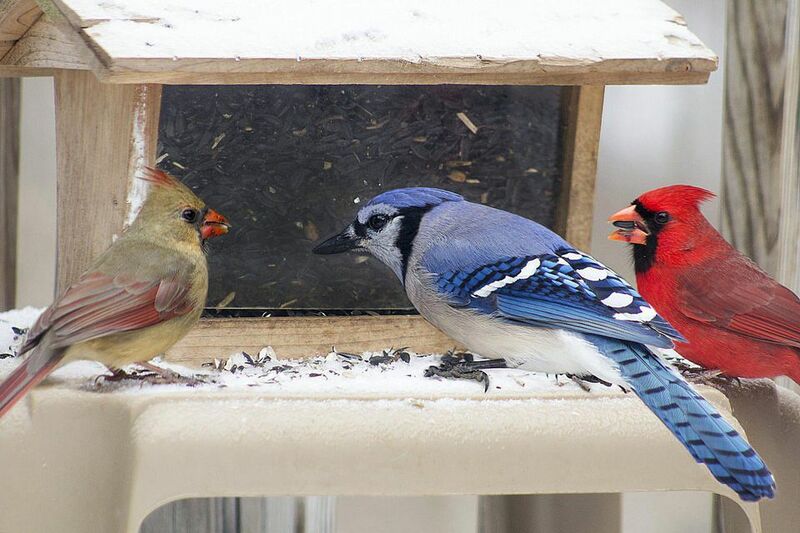 The most common winter birds include finches, sparrows, titmice, jays, woodpeckers, chickadees, and cardinals, though there are always other birds that may appear at full, enticing feeders. Birders in northern regions may have pine grosbeaks, evening grosbeaks and red crossbills visit their feeders in winter. Southern birders, on the other hand, may still have overwintering hummingbirds and warblers even in the middle of winter. Because natural food sources can be unpredictable in winter, there is always the possibility of a very unexpected and exciting visitor if feeders are reliably available. To attract the greatest number of species in the winter, it is important to have a number of different bird feeders available. While easy birdfeeders such as hopper and platform designs are always popular, the feeders you use during the winter should have several characteristics in common. Feeders will be most useful in the winter if they have a wide cover over feeding ports, perches and dispensing trays so seed is not buried during snowfalls or storms. Fly-through platform feeders are especially good designs for winter bird feeding. The cover should extend several inches over the edge of the feeder to ensure protection from all but the most serious storms. If a favorite feeder doesn't have a built-in cover, wide baffles can be added to keep snow and ice away. Ideally, winter bird feeders should be placed in sheltered locations out of the most severe winds. Placing feeders closer to the house will be effective and will help keep the birds visible for indoor bird watching. At the same time, feeders should be placed near protective cover such as hedges or a brush pile to offer birds safety from predators. To minimize window collisions, place feeders no more than five feet away from a wall or window, and use window clings or other techniques to help birds avoid the glass. For birders’ convenience, large capacity feeders are preferred for winter feeding because they do not need to be refilled as frequently. This is only viable, however, if the seed is protected from moisture, otherwise it may grow mold or fungus before it is consumed. Covered feeders with large capacities are suitable, but open platform feeders should be emptied and refilled daily to prevent mildew and spoilage. Because natural food sources are scarcer in the winter, more birds may be attracted to backyard feeders and those feeders will need to be cleaned and sterilized regularly. Proper cleaning will minimize mold, mildew and other unhealthy conditions that could foster disease among backyard bird populations. When cleaning, discard soggy seed or seed encased in ice, and let the feeder dry before refilling if possible. Be sure to wipe down perches, poles and other parts of the feeder as well. When choosing birdseed and other foods for winter feeding, take into consideration which bird species are present in the winter and what foods they prefer to avoid excess wasted seed. Many birders also prefer to use no-waste or no-mess seed mixes such as hulled sunflower seeds in the winter to avoid several months’ of hull accumulation beneath feeders in the spring. It is best to stock up on birdseed in the fall when many lawn and garden centers are discounting seed to make way for winter merchandise. Stored properly, seed can easily last for months, particularly seed mixes and sunflower seeds. To properly store seed, it should be kept in a cool, dry place that is protected from bugs and rodents. Choose a storage bin that will be easy to access all winter and one that can be easily manipulated while wearing gloves and bulky coats. Have a large scoop on hand to easily refill feeders, and you'll use more seed than you realize to sate birds' winter appetites and you'll be glad you had the extra storage. Just as food is scarce for birds in the winter, it is also scarce for squirrels, mice raccoons, stray cats and other backyard pests and predators. Steps can be taken, however, to safeguard feeding stations and provide birds the security to return to the feeders throughout the winter. Choose specialized feeders with pest repellents such as caged perches or squirrel baffles. Thick plastic or metal feeders will resist chewing best. Position feeders several feet from natural cover where birds can hide if necessary, but not so close as to allow predators a place for an ambush. Consider placing temporary fencing or mesh around feeding stations to keep predators and pest wildlife away. Clean off feeders, platforms, and perches after each storm so seed is easily accessible. Leave fruit and berries on trees, hedges, and bushes to provide a natural source of food throughout the winter. Add a heated bird bath to your backyard or place a safe heating element in a regular bird bath to provide birds with liquid water.